The Tusty is an old ship. She runs the Aleutian route for the Alaska Marine Highway. She was constructed in 1964, and though she has been refurbished since, a bit, she still has the feel of an old diesel ship. Or I am telling myself stories, because these are the ships I fall in love with, and I fell in love. 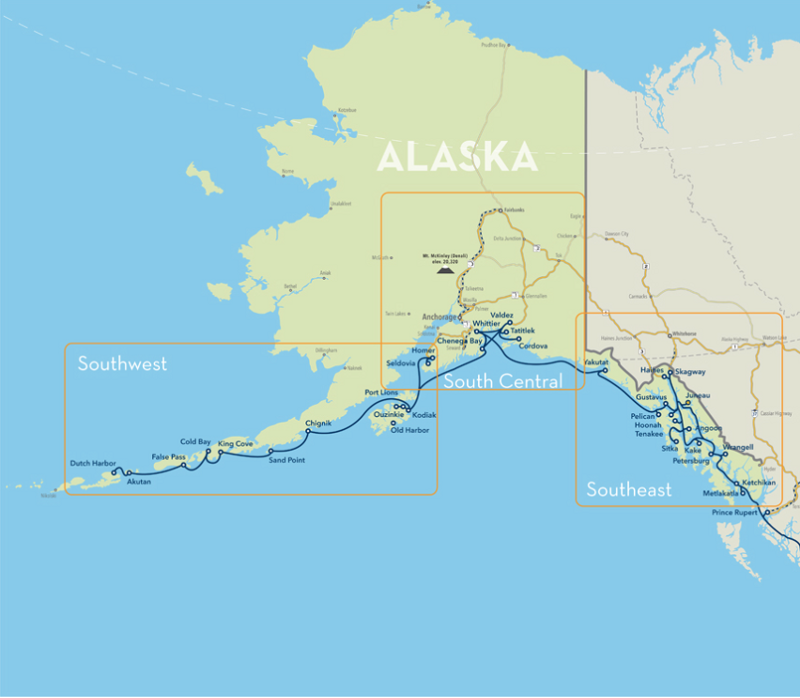 The Aleutian route, the Southwest, isn’t run all year. It starts when it starts, in the spring, weather permitting. The route runs out to Dutch Harbor, called Dutch, by the men I meet who live there, and Unalaska, a very poor approximation of the original Aleut word, by no one that I ran in to. I am told the oldtimers use Unalaska, but I met some old timers, and they stuck to Dutch. My first stop on my initial Alaskan adventure was Anchorage, from which I’d hop a tiny plane and fly to Dutch. My goal was to travel east or south, until I ran out of east or south or time or desire. The local flights out of Anchorage have no security. After a twelve hour wait in a room full of people, some of whom had been waiting for days, I ask the man next to me, why not? “Everyone’s carrying a knife or a gun, what would the point be?” They are also loaded up on shopping, hauls out of Costco, it seems, back to the remoter areas in which they live. A day of people watching in a local terminal is full of information. I learn that they weigh you because of how dangerous many of the landing strips are, in the outlying areas, and weight matters. I learn you never check your bag, because when the weight is awry, they just toss everything out and you may or may not see it again. I learn that you take on the plane with you everything you need if it crashes and you need to hike out of the Alaskan wilderness. I learn of meth operations strung along the island coasts, and the police protection in one of those towns, to keep it strong. I learn of prison life and the happiness of being free. I learn of drunks and disasters, hunting operations and outback hospital lives. The slow, patient frustration is broken by a fire on the tarmac. Perhaps we aren’t flying because the plane exploded! There’s a bit of glee in this, with the impatience, the thought that there is more of a reason than the usual reason. Turns out that the bored plane workers piled up old tires and lit them on fire, in order to put them out. A test of their fire fighting skills. Thick black stinky smoke coats the runway and slithers into the waiting room. Once the fire is out, unamused, the people turn away. The way the airline works is that if your flight is canceled, you go to the bottom of the list. I am sitting in a room with three days worth of cancellations. Two days later, they board us. As we board, I am handed earplugs, and all the burly fisherman around me immediately start putting them in. So do I. We are tucked into a tiny plane, vibrating like mad, loud, too loud to talk, let alone to think. We take off, and make it to the first spot, a few people get out, they let us out if we want, nothing in Alaska is fast, nothing is on a timetable, nothing written is likely to be true. Reload and off to the next island. We drop to descend and it is pitch black. Pitch black at the brightest spot of day. 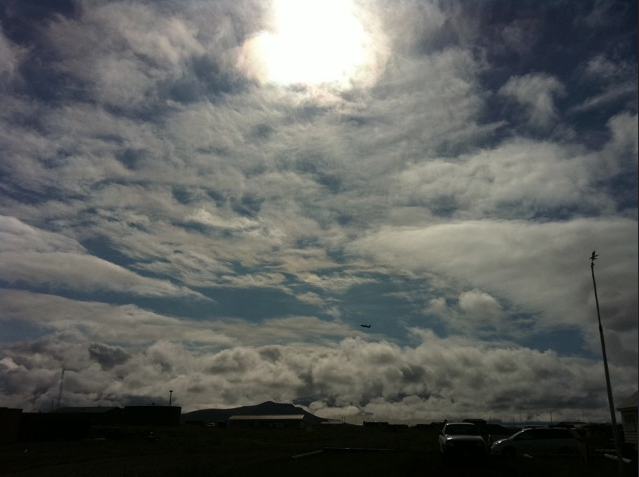 The plane swoops a tight u-turn, then another, then another. We go slightly up and slightly down as we do this. Nothing but grey and black outside the window. We fly back to the airport we’d left from. One of the locals explains to me, the runway on Dutch has a loop against the mountains and landing blind isn’t very safe. The altitude shifts were the pilot trying to find even the slightest glimmer of the rock wall behind the strip, so he could pop the landing through it. Nothing though, it’s been like this for days. I think that perhaps I’d be happier to land there if I didn’t know any of this. After standing around the airstrip for a bit, they decide to try again, rather than fly the three hours back to Anchorage and try tomorrow. They add fuel?—?enough to get us there but not so much to overweight the plane, and we make another go at it. No luck. Back to Anchorage and another evening spent like all the others, sleeping in the local terminal, listening to stories, learning about this land. The Tusty will have to wait for me, another day.